Aprilia Forum: Aprilia Motorcycle Forums > Vendors > Vendor Deals > St. Patrick's day sale & giveaway | up to 20% off! St. Patrick's day sale & giveaway | up to 20% off! As close neighbors of our Irish friends, we definitely love to share this moment of celebration with them as well as with all of our customers. This is why we have prepared a whole weekend-long double promotion, open to everyone! From now through Sunday, shop all of our collection of high quality parts for your Aprilia, Ducati or MV Agusta with discounts of UP TO 20%! 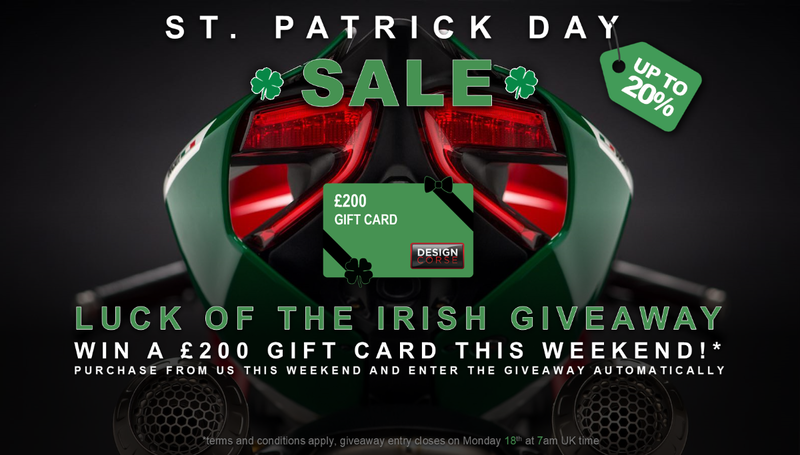 On top of that.. place an order before Monday 7am UK time and you will automatically be entered in our St. Patrick's giveaway pool, giving you a chance to win a £200 Gift card for you to use and spend however you like! During this sale, you will be able to have access to all of our world famous brands at lower rates: Moto Corse, CNC Racing, AEM, FM, QD, HP Corse and many more, don't miss this chance to try your luck with us while dressing your bike with some of the best aftermarket parts available on the market! Please note: As per most other promotions run by us we will be deactivating coupon codes for the remainder of the sale duration. In order to be able to post messages on the Aprilia Forum: Aprilia Motorcycle Forums forums, you must first register.